Hi folks… I’m sure I’ll share about 40% of what I want to share here but I need to get this off my chest so I can get back to work. 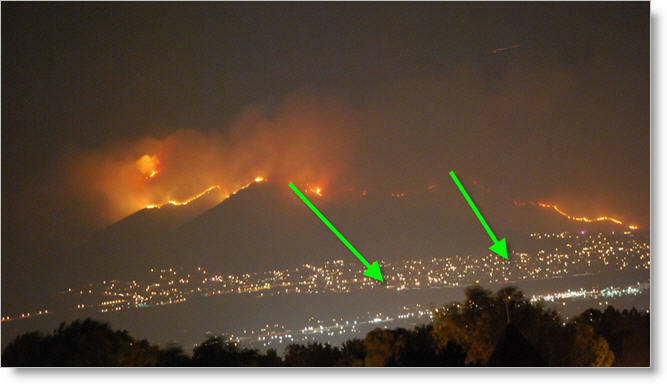 One of the best pictures of the Herriman Fire I’ve seen, I think our house is around one of these two arrows. Last night we left Herriman about 4pm to go to a family birthday party about an hour south. We noticed a fire in the Camp Williams area and it looked pretty big. There’s a hill between Camp Williams and my neighborhood. About 6 years ago, when we first moved in, there was a fire up on the hill and it was kind of a spectacle, but we didn’t feel threatened. We didn’t think much about it as we went to the party. On the way home the smoke/fire was much larger, but still not anything we were concerned about. We went to a friends house and picked raspberries until it was too dark to see anymore. About that time we noticed a bunch of gawkers… neighbors of our friends were getting on their roof with cameras and binoculars. We could, through the houses, see the fireline way up on the hill. It was brilliant, in the dark… an orange line across the hill. As we drove home (about a mile) everyone… everyone seemed to be out. Cars were parked along the road and people where on the sidewalks just looking. Families where out on their porches with cameras. 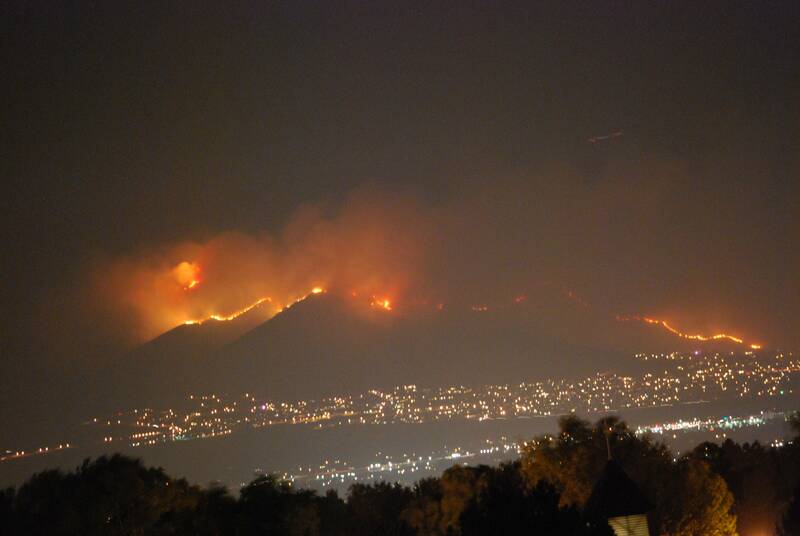 We finally got the news on about 9pm (Twitter had much more info (hashtag #herrimanfire)) and learned there were about 250 houses evacuated from The Cove – a nice neighborhood very close to the hills, as well as all the houses up the canyon. Soon we heard there were 750 houses evacuating… unfortunately no one had a map available (my biggest beef with the emergency response). My family was out in our backyard looking and I heard a police loudspeaker (or something like that) but I couldn’t understand it… so we walked to the corner of the main busy street (about 5 houses away). It was amazing – LOTS of smoke, lots of ash and lots of congested traffic trying to get out. A neighbor said they were leaving because of the smoke, and that’s when I thought that sounded like a good idea. I didn’t want to wake up to 5 kids crying at night with smoke/breathing problems and have to leave in the middle of the night. I got home and we started packing… it went well, even though my two young daughters were scared and traumatized. I gave them jobs to get their mind off of scary stuff… and eventually we piled in the van. I thought we would be stuck trying to get out of Herriman but we were on the main highway, with no traffic, within 10 minutes (usually a 5 minute drive to get there), and rolled into my in-laws’ house at about midnight. The kids dropped quickly and my wife and I watched the news for about 30 more minutes… then we crashed. Today I’m speaking and tomorrow I get on the road for a conference in Dallas. I was supposed to pack, at my leasure, tonight… hopefully I got all I needed to because I don’t think I’ll be sleeping at home tonight. Thank you to all who have called, chatted, tweeted, texted, facebooked, etc… we are okay and feel loved and blessed. This is a traumatic event, and I know some families lost homes, and many people are scared. However, we are so blessed and not alone, as the community has pulled together in a big way – we had friends prepare beds for my family last night, in case we wanted to stay there. Stores and businesses have donated food and water, etc. I think about those in Haiti, who didn’t get that support, or those in the recent California pipeline blast who lost their entire neighborhood,… or what if the fire destroyed lots of homes (so far only 4 or 5), etc. Not to trivialize what’s going on but it could be so much worse. Thanks again for your thoughts, prayers, concern,… we are and should be okay.